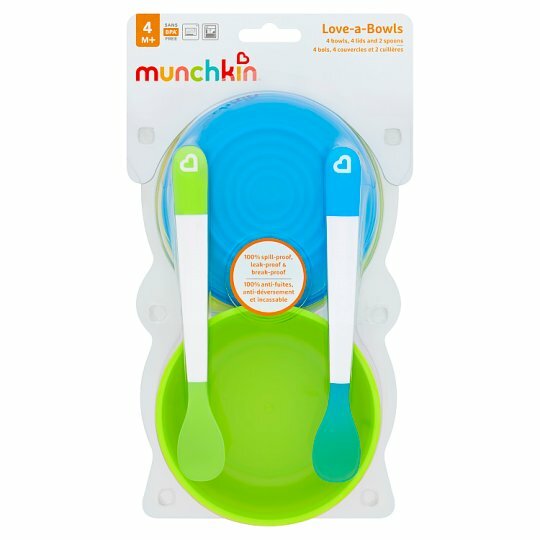 Your first set of baby bowls with snap tight lids to take you from purées to pretzels, first foods to first day of school - and everything in between. *Designed for re-heating prepared food. Microwave-safe bowl. Lift or remove lid before microwaving. Do not microwave spoon. For your child's safety and health. Warning! Always use this product with adult supervision. Before each use, inspect the product. Throw away at the first sign of damage or weakness. Always check food temperature before feeding. Before first use, clean the product. Do not boil or steam sterilise. Do not use abrasive cleaning agents. Do not expose in direct sunlight. Do not let child walk or run while carrying the product. Top rack dishwasher safe. Please read and retain this information for future reference. Remove all packaging components before use. Not suitable for grill, oven or hob.